You’ll cross the Strait of Gibraltar to Morocco on the African continent by ferry to step back in time in Rabat, a UNESCO World Heritage Site and Morocco's capital since 1912. Fez is still Morocco's cultural and spiritual center, and its centerpiece is the Medina, a UNESCO World Heritage Site founded in the 9th century and whose palaces, madrasas fondouks, residences, mosques, and fountains date back to the 13th-14th centuries. These are just some of the many highlights on this comprehensive and affordable Spain, Portugal, and Morocco tour. It's a memorable budget vacation for value-mind travelers. ARRIVE IN MADRID, SPAIN. Check into your hotel. Take advantage of any free time to explore lively Madrid with the help of the CosmosGO app. Tonight, meet your Tour Director and fellow travelers. MADRID. Spaniards say the Spanish capital, situated 2,180 feet above sea level, is the nearest thing to Heaven. It’s certainly worth making the most of today by joining the included guided sightseeing tour: a full panoramic drive by way of the Avenida Mayor, Puerta del Sol, Parliament Square, and a picture stop outside the Royal Palace. The optional trip to Toledo is most rewarding, too. The splendid setting of this old walled city above the Tagus was made famous in El Greco’s painting, and even now it’s like a great open-air museum of Spanish history and art. MADRID–ÁVILA–SALAMANCA–COIMBRA, PORTUGAL. Visit ancient fortified Ávila with its many towers, a UNESCO World Heritage Site. Continue to Salamanca and make sure you spend some time wandering around PLAZA MAYOR, the grandest square in Spain. Cross the frontier to Guarda, the highest town in Portugal. From here, descend to the valleys of the Serra da Estrela to Coimbra. COIMBRA–FÁTIMA–OBIDOS–LISBON. Enjoy an orientation tour of Coimbra, celebrated for its beauty and ancient university. Later, travel southward to visit the SANCTUARY of Fátima, one of Europe’s most visited Marian shrines. Continue to picturesque fortified Obidos, before reaching Lisbon for two overnights. LISBON. Henry the Navigator made Lisbon the 15th-century “Mistress of the Seas.” On the included guided tour, see his monument, the Belem Tower, the Moorish Citadel, and the impressive Commerce Square, also known as Black Horse Square. Spend the afternoon at leisure—maybe in the Alfama’s tile-decorated streets, or take an optional excursion to coastal Estoril and Cascais. LISBON–SEVILLE, SPAIN. From the rolling plains of the Alentejo with its woodlands of cork and eucalyptus trees, head south to the brilliant light of Andalusia. Admire its neat, white-painted villages and sun-drenched plantations of olives, figs, and almonds while traveling towards magnificent Seville. SEVILLE. Enjoy an included sightseeing tour of this vibrant city’s main highlights, such as the cathedral, Alcázar, and Plaza d’España. Afternoon at leisure. 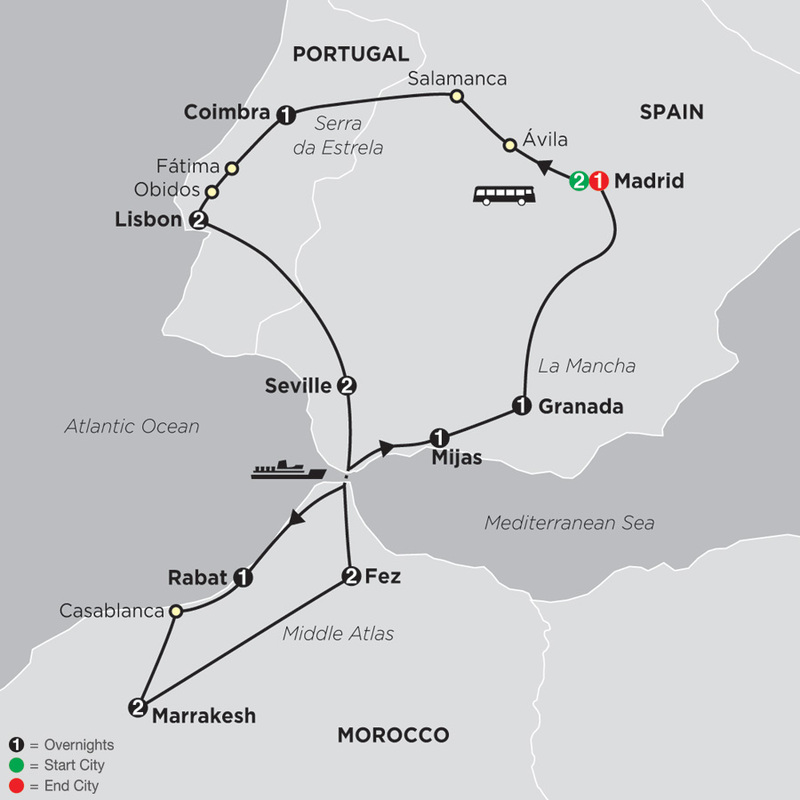 SEVILLE–FERRY TO MOROCCO–RABAT. Drive through Spain’s pretty sherry wine region and head south to the coast. Here, you will embark the FERRY and cruise across the Strait of Gibraltar to Morocco on the African continent. Travel along what was once the infamous Barbary Coast, then continue the drive south to Rabat, one of Morocco’s imperial cities. RABAT–CASABLANCA–MARRAKESH. Today starts with an included guided city sightseeing tour of the country’s lively capital, a visit to CHELLAH GARDENS and CASBAH DES OUDAIAS. Later, reach Morocco’s westernmost city: Casablanca. Enjoy an orientation drive in this modern city and see the illustrious Hassan II Mosque. One of the largest mosques in the world, its minaret soars 689 feet into the sky. Continue on to the “red” oasis city of Marrakesh. An optional excursion this evening is the perfect end of the day. MARRAKESH. Today’s included city sightseeing with a Local Guide will make you feel like you’ve been whisked back in time. Founded in the 9th century, Marrakesh remains a tapestry of ramparts, mosques, palaces, gardens, and vibrant public squares and souks (markets)—where buying and selling and a fascinating carnival of entertainment occurs daily. Also see the BAHIA PALACE and SAADIAN TOMBS. MARRAKESH–FEZ. Today, travel through the fragrant cedar forests of the Middle Atlas mountains, where a number of peaks soar above 13,000 feet in elevation. This range is home to the endangered Barbary ape, as well as wild boar and polecats. On your way north to Fez, enjoy glimpses of North African village life. FEZ. Ancient Fez is a city of outstanding scenic beauty. Visit the MEDINA during the included sightseeing tour this morning, and enjoy the maze of narrow streets through the colorful bazaars and exotic atmosphere. 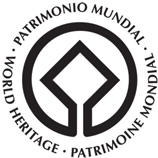 The madrasas, fondouks, palaces, residences, mosques, and fountains dating back to the 13th century are part of the UNESCO World Heritage Site. In the afternoon, explore further on your own. FEZ–FERRY CROSSING TO SPAIN–MIJAS. Today, an early departure takes you north for the FERRY crossing back to mainland Spain to the Costa del Sol (Coast of the Sun). Overnight in Mijas. MIJAS–GRANADA. Travel along the Costa del Sol and head to Granada in the heart of Andalusia. On the agenda: an included guided visit of the ALHAMBRA COMPLEX*, a lavish palace and fortress built by Moorish kings. You’ll marvel at its architectural Moorish beauty and magnificent gardens, with construction dating back to 889 AD. GRANADA–MADRID. Travel through the very heart of Don Quixote’s La Mancha, famed for its castle and windmills. Before arriving in Madrid, visit a local WINE CELLAR and taste some of the locally produced wines. MADRID. Your vacation ends with breakfast this morning. "After so many years in this fascinating land, I never get tired of showing people the wonders of Spain, Portugal, and Morocco. Every tour is an adventure...a unique cultural experience I share with my guests. Like a storyteller, I can´t wait to meet my audience and start the show. Introducing travelers to the people, colors, and flavors of the region is exciting-something you just can't get from a guidebook!"